The Lupus Colorado Community Walk is back for a forth-straight year! The 2018 Walk was a huge success, drawing over 450 participants and raising over $69,000, to benefit lupus families in Colorado. Every dollar raised at the Lupus Colorado Community walk stays in the State of Colorado to benefit the more than 30,000 Coloradans living with lupus. By participating in the Lupus Colorado Community Walk, you are directly impacting fellow Coloradans living with this debilitating disease. Our event is more than a walk; it is a celebration for the whole family complete with a DJ, photos, face painting, arts and crafts, yard games, and a crowd favorite, cotton candy. Location – We are excited about our second year in a row at this beautiful location. The Hudson Gardens and Event Center – Garden Canopy, which has ample shade, parking, and a gorgeous walking path offering multiple walk lengths! Snacks – Instead of food trucks, light morning snacks will be provided free to all participants. In addition, walk participants are encourage to bring a picnic lunch to enjoy in the gardens following the walk. Wellness Village – We will have additional new health-related vendors and information tables for patients and caregivers. For the safety of all participants and Hudson Garden Rules, no dogs are allowed at the event. We encourage you to form a team and invite friends and family to join your team and help you FUNdraise. Fundraising incentives will be given for individuals who reach the $500 and $1,000 fundraising milestones. A prize will also be given the Top Fundraising Team and Top Individual Fundraiser. Needs ideas on how to fundraise for your team? Check out our A-Z Fundraising Ideas! Show your team spirit as prizes are given for the Best Dressed Team and Most Creative Team name! Follow us on Facebook for regular updates throughout the spring and summer. 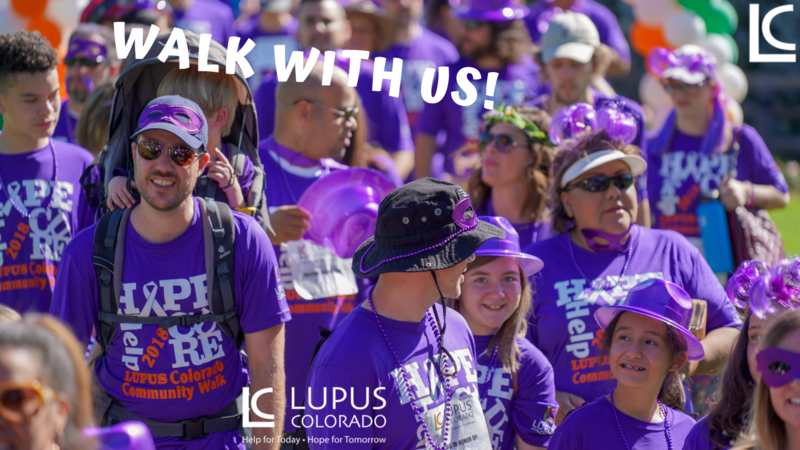 Questions about the walk or how to register: Contact Kristen at kristen@lupuscolorado.org or 303.597.4050. Local sponsorship opportunities enable companies to gain exposure throughout the community while supporting this important cause. Providing a cash or in-kind donation helps keep event costs down and results in more funds directed to research, patient education and services. There are several ways your company can support the Lupus Colorado Community Walk. 1. Outright sponsorship: provides the ability to engage with consumers and prospective clients in a positive environment. For information on sponsorships, please email kristen@lupuscolorado.org or click 2019 Lupus Colorado Sponsorship Opportunities for the sponsorship form. 2. Corporate Team Formation: offers a fun and exciting way to engage employees in the community, increase employee satisfaction and foster healthy fundraising competition. Lupus Colorado will provide all the necessary materials and support to recruit company Team Captains, assist with goal setting, and help create an easy fundraising plan.